Though the best instrument for stargazing is your own two eyes, there’s nothing like bringing lunar craters, star clusters, or nebulae into focus through a telescope. You can buy a good entry-level instrument for a few hundred dollars up to a thousand or more. Here is a brief guide to help you decide what to look for. • Don’t buy the small instruments you find at most department stores. They are little more than toys, and produce a poor view of the night sky. • Don’t buy a telescope if you want something simple and easy that you can quickly take into the back yard. Instead, consider a good pair of binoculars. • Don’t buy if you’re not committed to learning how to use the telescope and learning your way around the night sky. Like countless treadmills and dumbbells, it will end up stashed in your closet or garage. 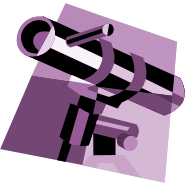 Amateur skywatchers can select from three basic types of telescopes. A refractor is what most of us think of as a telescope — a long tube with a series of lenses to gather and focus starlight. Refractors provide the clearest view, but the high-quality lenses make them more expensive than other types. They are also longer than other types, making them difficult to move. A reflector uses mirrors instead of lenses. The primary mirror, at the base of the telescope, reflects the light to one or more secondary mirrors, which direct the light through the eyepiece. Because the light bounces around inside the telescope, its tube is shorter than a refractor of the same light-gathering capacity. A reflector provides the biggest bang for the buck, offering lower prices than other models of the same aperture. A compound telescope uses a combination of mirrors and lenses. It’s usually fairly compact, and its price is between that of a refractor and a reflector of comparable size and quality. Any telescope’s key statistic is its aperture — the diameter of its primary mirror or lens — usually measured in millimeters or inches. A larger aperture allows the telescope to detect fainter galaxies, nebulae, and other objects, and shows more detail. Not surprisingly, however, a larger aperture means a higher price. It also means a bigger, heavier telescope that is harder to transport and set up. For most beginners, something in the 70- to 100-millimeter range (3-4 inches) generally gets the job done. The view through the telescope depends on both the aperture and the eyepiece. Many beginners select an eyepiece that is too strong. Low to medium power generally provides the best view of the Milky Way, the planets, galaxies, and other popular targets. The telescope’s magnification or power is determined by its objective focal length (the length of the path that light follows through the telescope) divided by the focal length of the eyepiece. A good combination is somewhere in the “100-power” range, although it varies depending on the experience of the user and the desired skywatching experience. Of course, the best telescope in the world won’t provide much of a view if it shimmies and shakes all the time. To keep it steady, you need a good mounting — something steadier than the mounting you use for your digital camera or video camera. An altitude-azimuth mounting allows you to move the telescope both up and down and side to side, making it easy to track objects as they move across the sky. An equatorial mounting provides the same degree of freedom, but it makes it easier to compensate for Earth’s rotation. It is more complicated, though, because it requires you to align the telescope with the North Star, Polaris, which may be difficult for beginners. Today, many of these mountings are motorized, and some use computer controls to point to any desired target. Such systems are more expensive and complicated, though. A Dobsonian mount is a simple version of an altitude-azimuth system, with the telescope mounted on a simple platform that sits on the ground. A Dobsonian is fairly inexpensive and easy to use. A pair of 7x50 binoculars offers a comparable field of view and magnification to an entry-level telescope for less money. Planetary conjunctions, lunar occultations — even the next great comet — will look just as sharp through good binoculars. The view suffers only with the lack of a good mount. You may want to brace yourself against a tree for steady observing, or invest in a solid tripod. On the other hand, binoculars are much more portable than a telescope — a handy feature if you have to drive beyond the glare of city lights to do your stargazing.